I loved seeing all of the beautiful flowery creations in the gallery! Thank you to everyone who played along in our Photo Challenge, you all deserve a round of applause. It looks like there are a lot of people like me who are ready for spring and all of it's beauty. Congratulations, Christine, you are our Chic of the Week! 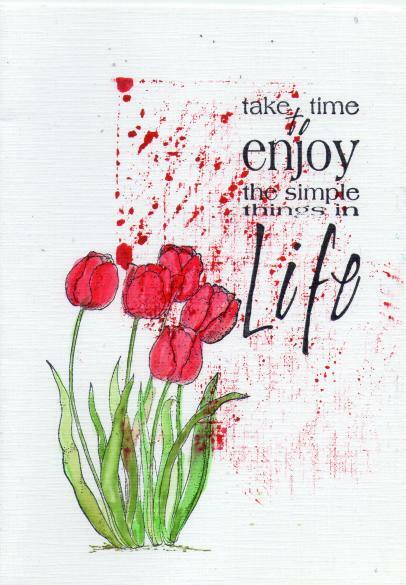 I just loved that background and sentiment paired up with those beautiful tulips. Please email me at qvande@hotmail.com so I can send you your Chic of the Week Badge! Come back tomorrow for our Word Challenge to see what Word Bobby has chosen for our inspiration. Congrats, Christine. Your card is beautiful, a well-deserved win!!! This card is fabulous! So artsy ! Congrats Christine ! Congrats on your gorgeous card Christine!